Our installation and engineer management processes ensure customer satisfaction is the priority of everyone within our organisation. We are driven by being the best and customer satisfaction is at the centre of everything we do. 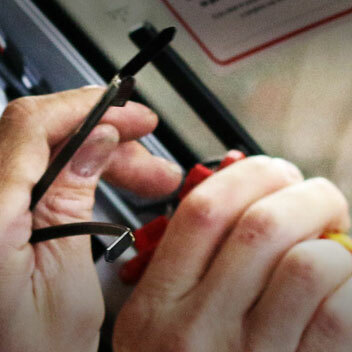 Installation quality inspections are conducted by our experienced engineering management team. These are completed alongside our FCS1362 FITAS engineers and, if necessary can be implemented to a clients exact specific auditing processes. Our highly qualified Engineer Managers will check the whole installation experience, including the Engineer’s communication with the host site, while checking that site safety regulations have been adhered to. Our inspection process includes auditing the placement of equipment, compared to the agreed specification and included a photo of equipment placement. Additionally, they will inspect the installation of all wire routing. Our clients are supported by a dedicated and qualified Project Manager who would liaise closely with the operational team and all stakeholders to ensure the project objectives are successfully met. We work closely with client operation teams to create an installation plan and processes that will be followed throughout the lifecycle of the project. Our project management team are experienced in a broad range of implementation and installation projects, they successfully complete 1000’s of installation projects every year. We can scope and create comprehensive install specification documents for our clients prior to starting any installation work . Our specifications are designed so they are consistent across different vehicle manufacturers. We indicate actual product locations and install pick up points on all vehicle types within a project and include a full ‘Build of Materials’ (BOM) breakdown. Our courteous and professional sales team is knowledgeable about the latest vehicle technology solutions that are available. The foundation of our advice is based on fact-finding conversations with our customers. We have a full range of communication, safety and telematics products available through our comprehensive vehicle tech store CLICK HERE. We also have our own proprietary TECh range of market leading vehicle technology products. Our innovative TECh product range has grown to become a market leader in the transport, logistics, fleet and emergency services sectors. Our TECh product range has expanded and developed into 14 specialist product categories, view our range today CLICK HERE. 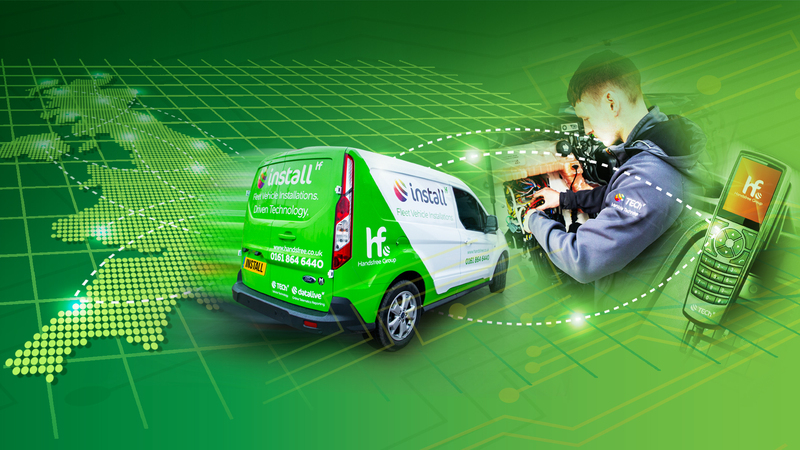 Experienced Handsfree Group engineers will install your equipment at any location convenient to you any time, day or night to minimise vehicle downtime. 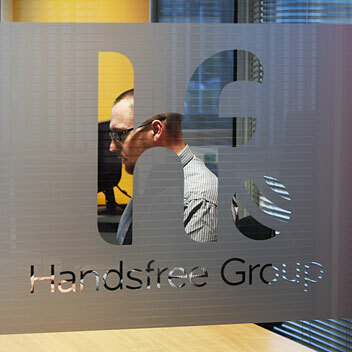 All Handsfree Group installations comply with the latest industry standards. Engineers are regularly trained, audited and mentored to maintain high quality. 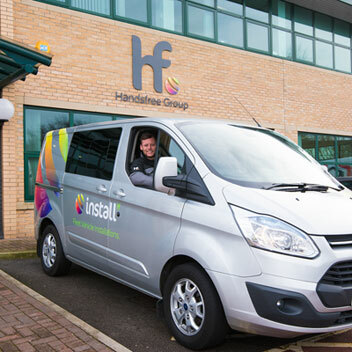 A Handsfree Group warranty guarantees a fast response if a fault develops with your product or installation. 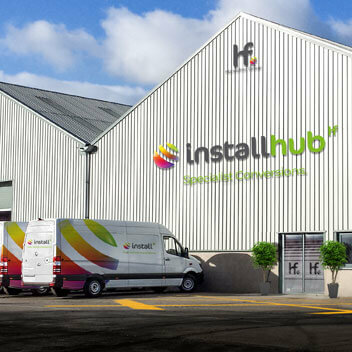 With a state of the art 10,000ft² workshop in York – Installhub is a specialist vehicle conversion facility allowing freedom of choice for our customers for oﬀsite installations and full vehicle conversion ﬁt outs.